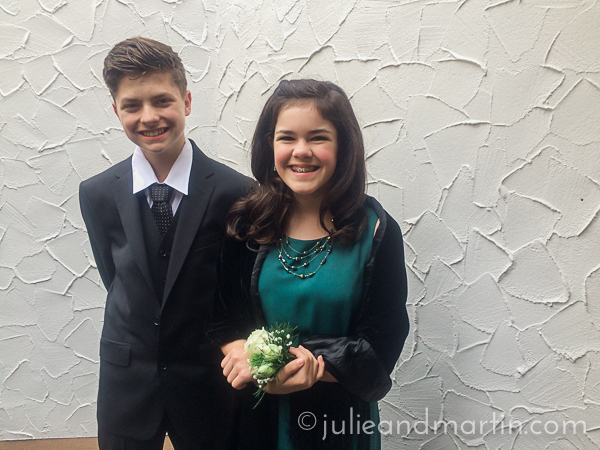 My sweet girl went to her first formal dance last week. 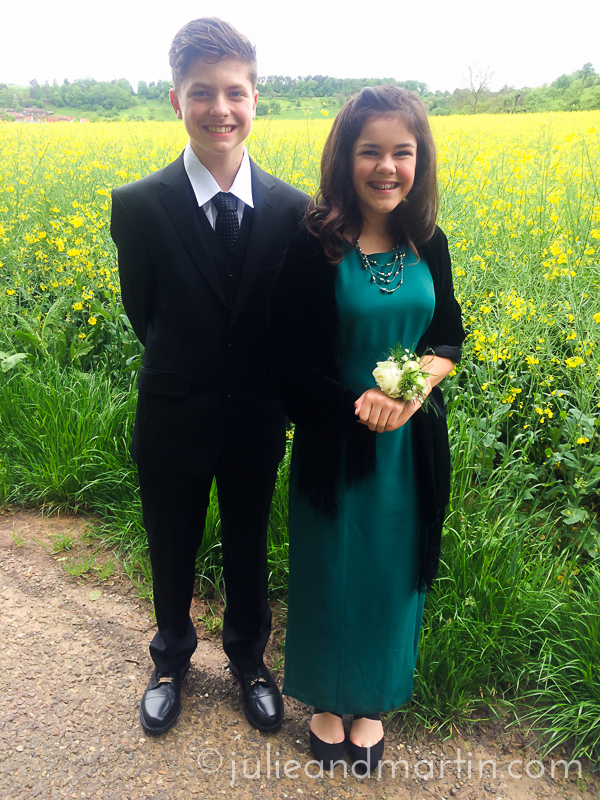 Her middle school organized it as a last special event for the eighth graders before they all head off to high school. 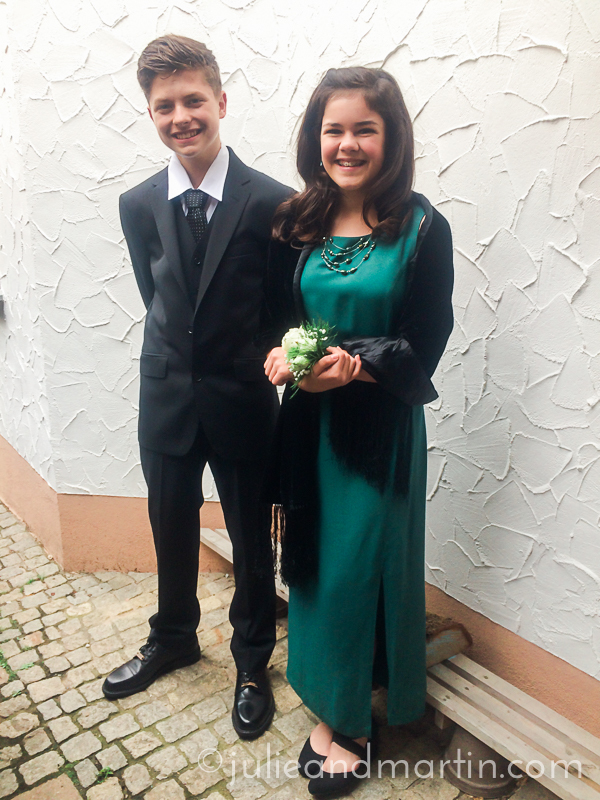 Since we’re putting all three kids into the German school system beginning next year, this may be the only opportunity for Miss C to attend a formal dance. 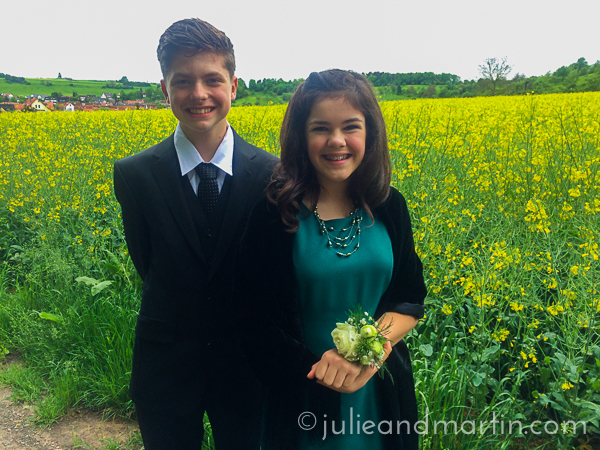 So, we allowed her to invite a friend — a fellow American who lives in our village — as her date. After my appointment at the hospital Friday morning, I went home to rest, mostly because I was exhausted, but also because I wanted to have enough energy to help her get ready. 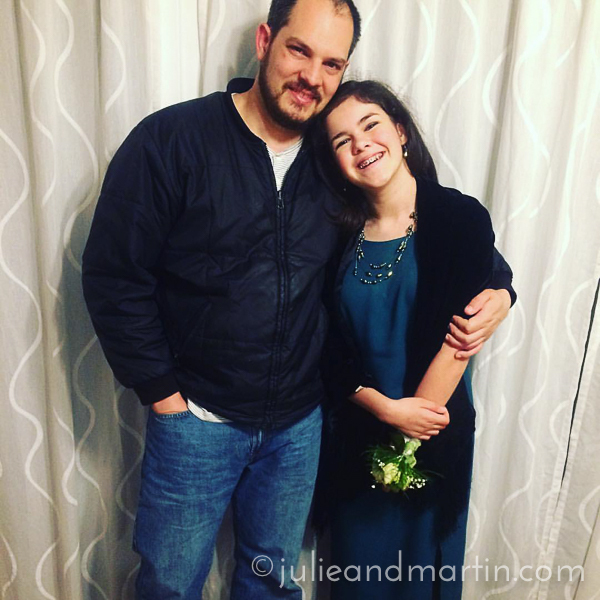 She decided to wear one of *my* dance dresses from the 1990s, settling on a classic green dress I wore to a friend’s Prom in 1996, as well as a Homecoming dance later that year. I was stunned when it fit her so well, and excited that she liked it as much as I did, too. 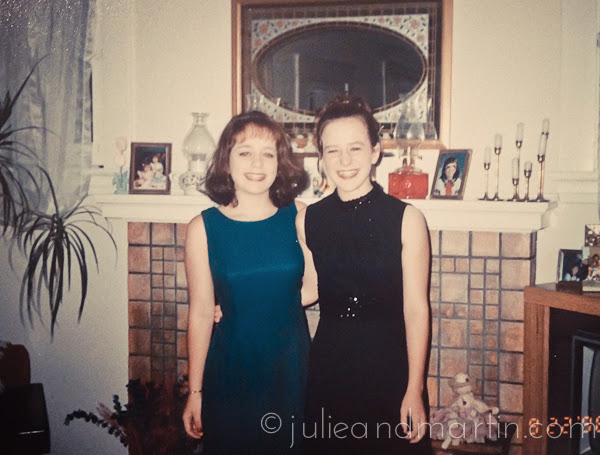 My sister Jill and me before Homecoming in 1996. Once Miss C got home from school, we started prepping, rolling her hair in velcro rollers and getting her make-up squared away. The night before, I showed her photos of movie starlets from the 1930s and 1940s, with their classic make-up and wavy hair, and used those for inspiration. Needless to say, she looked beautiful and so grown-up. 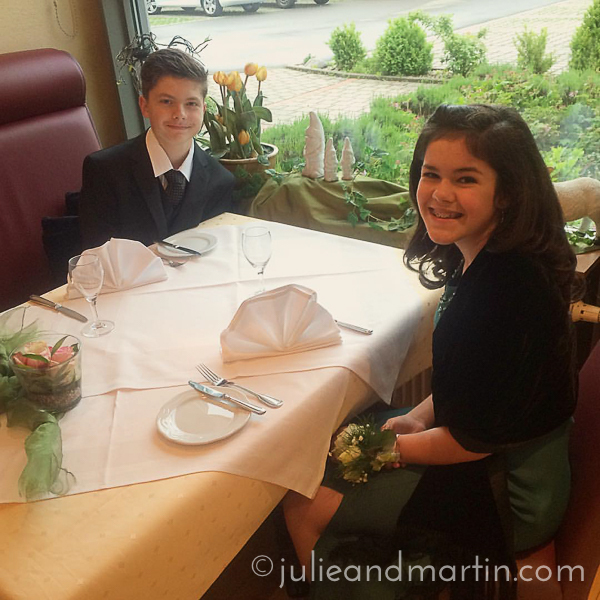 We picked up her friend, and headed to the restaurant where Martin made a reservation for the two of them. Along the way, I stopped by a field of rapeseed and took photos. Ha!!! 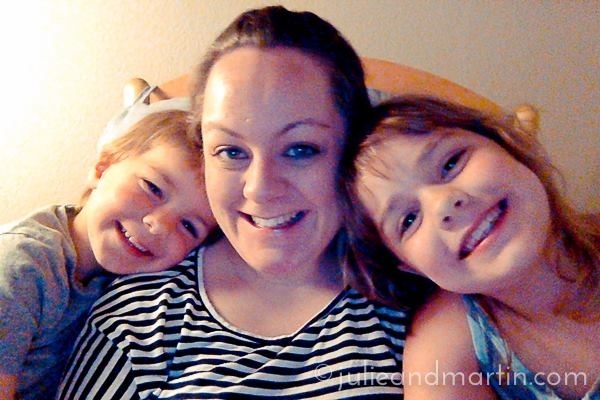 I am THAT mom, for sure. These two were such good sports, though. 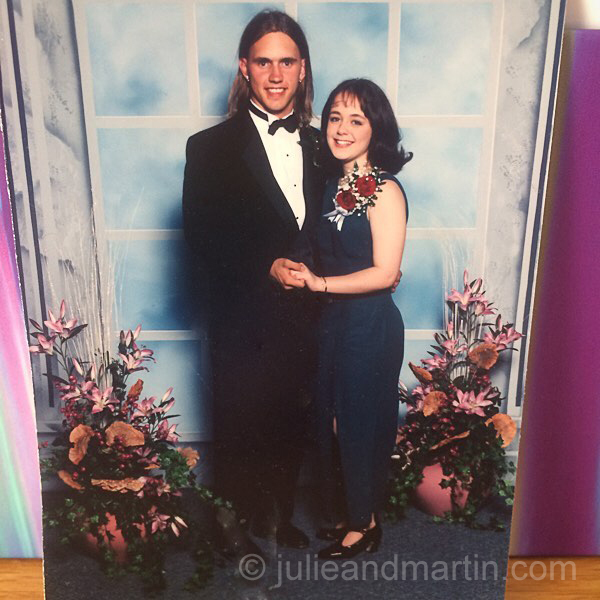 By the time they were finished, Martin was home from work, so he picked them up, and dropped them off at the dance. He said they had a great time at dinner, and seemed very relaxed and talkative. I was so glad to hear she was having such a nice time! Meanwhile, back at home, I hung out with these two, thanking them for being so patient and cooperative that day. We had a lot going on, and the oldest and youngest-to-be have been getting a lot of attention lately, but I’m thankful they are old enough to understand, and they do a good job looking out for each other and helping me! And they don’t mind when I call them “My Middles.” We agree: what’s the best part of a cookie? The best place to sit in a movie theater? The most interesting part of a sandwich? The best spot in a group hug? THE MIDDLE! Anyway, at the end of the night, Martin went to retrieve our girl and her date. They had a great time, and she said she got a lot of compliments on her dress. After changing into some sweats and slippers, she headed out to a sleepover with her girlfriends. Kudos to her personal chauffeur, who apparently kept the Dad jokes to a minimum.